Joe Cuanan joined Treehouse while working as a project manager. 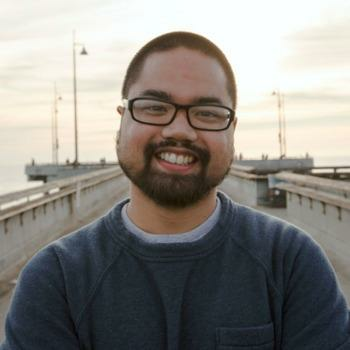 After 6 months of learning to code, he transitioned into a new career as a front end developer. We met with him to hear more about his experience and how his life and career have evolved since learning to code. You can watch Joe’s full interview at the end of this post. One of my favorite parts of being a developer is being able to create something that didn’t exist before that makes the world a better place. A few years after university, Joe found himself in a steady career but drawn to making a significant change in direction towards making a difference in the world as a developer. Taking the risk to prepare himself for a career and industry transition was a daunting one, but Joe had always valued education and the limitless opportunities that came with it. He was confident that with dedication and the right learning resource to keep him on track, he’d be able to achieve the career switch. Joe had had a lifelong interest in technology, but in university had chosen not to pursue a traditional Computer Science degree as he’d always assumed he didn’t fit the mold of a developer. However, when he began to learn to code himself, he realized that there was not one single type of developer. Anyone could have the capacity to create something of value with code and that the individuality and diversity of developers created the most valuable outcomes. He saw this first hand when he started his new career as a developer and worked on product development alongside developers with diverse experience and backgrounds, combining their perspectives to create enhanced experiences for their users: “I think that there’s definitely a stereotype of what a typical developer looks like, but in reality the future is a lot of different people from diverse backgrounds coming together and building something great.” Experiences like this were just one of the rewards for Joe and confirmation that he had found a career he was passionate about and could enjoy day in and day out.